Journal of Anglican Studies provides a serious scholarly conversation on all aspects of Anglicanism. It embraces history, theology, worship, ethics, scripture, canon law, aesthetics and education. Anglicans live enmeshed in many different cultural contexts. How their faith is expressed in the particular and how it is shared across the globe is a fundamental issue in this tradition. 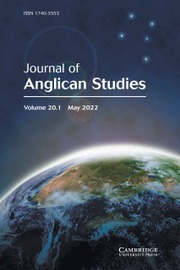 With its international reach, Journal of Anglican Studies is able to focus on this question and by doing so offers a distinctive and unique contribution to our understanding of Anglicanism today.